The studio has been very busy, shifting gears between a working art studio and a classroom. Most of the time when I need to work out there, I just use one of the class tables and clean up once a week when my students are due to arrive. That is the case this afternoon, as I get ready for tonight’s class. A couple of the students have warned me that I am not going to be able to stop classes after 8 weeks. It’s their clear intention to keep going. 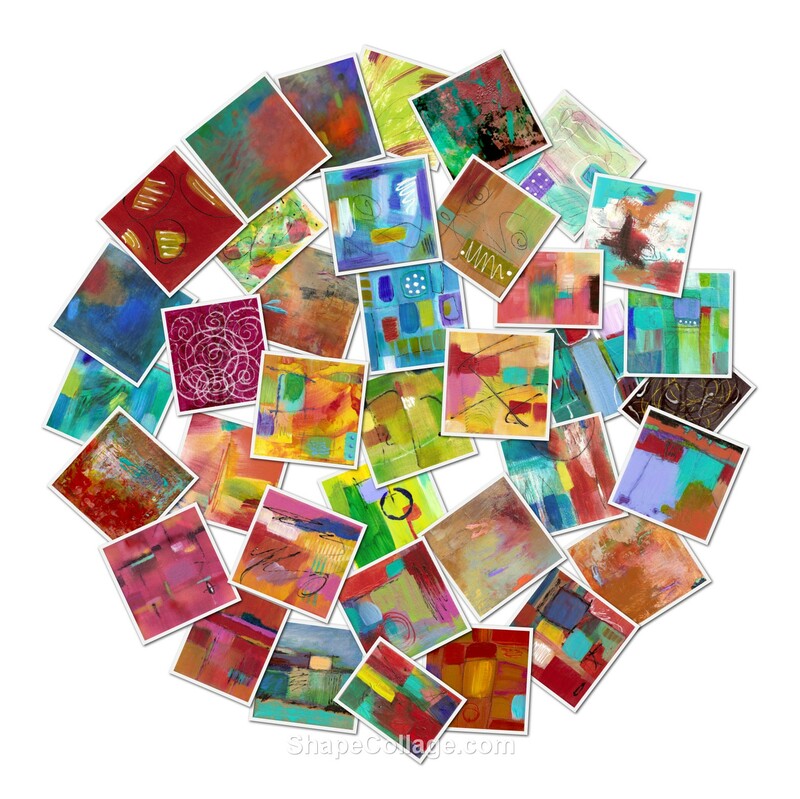 Today I was in a silly mood, so I downloaded a nifty program that I saw on Cath Sheard’s blog, called ShapeCollage. It’s free and easy to download and use. You can add as many photos as you like to create a collage/montage, and then choose the shape you want it to be. Great fun — and the perfect diversion for someone who’s avoiding work at the moment, Cath! Here’s my collage from some of my small works, and I chose a circle. Still enjoying my new ACEOs/Art Cards. Today I sent out one that has already sold. You can see them all here. What’s happening in your world? Are you taking some time out for fun? Thanks so much, Maureen! Nice of you to drop in. Do come back! sounds like a great time, both in the classroom and just arting in your studio. Brenda, I get such a shot of energy when I’m in the studio. It’s wonderful just to hang out there. Having fun for sure….in the Mayan,….sunning, painting, producing crap and some quality work but on a holiday and that is the main focus….everything else is gravy. Karin Lynn, I am jealous!! Hope you’re having a wonderful time. There’ s something quite magical about seeing art grouped – love it. And thanks for the mention. Hugs cross the oceans…. Thanks, Cath. And big hugs back! Hi Martha – I am finally catching up and getting a chance to read your blog again. After too long. I’m so happy for all your exciting new adventures! Teaching is so fun and rewarding. And, your studio looks so great! So nice to see you again, Jennifer. Hope you’re creating wonderful things!